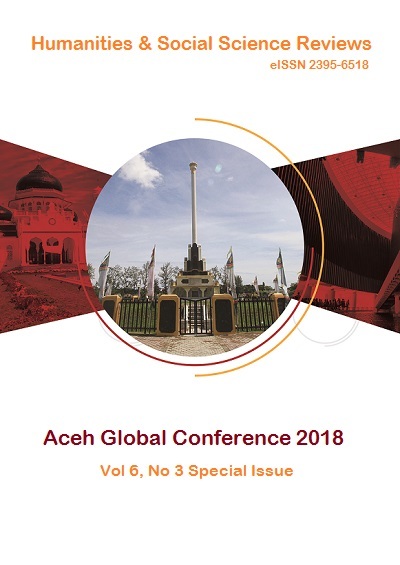 FUNDAMENTALISM AMONG ACEHNESE YOUTH: ACEHNESE UNIVERSITY STUDENTS’ ATTITUDES ON RELIGIOUS FUNDAMENTALISM, RIGHT-WING AUTHORITARIANISM, AND MILITIA SENTIMENTS | Humanities & Social Sciences Reviews Articles invited for Vol 7, No 2 issue. Upload before 30th May 2019 in Make a Submission tab. Purpose:This study aims to measure the attitude levels of Acehnese university students on religious fundamentalism, right-wing authoritarianism, and militia sentiments and determine whether there are strong correlations between these attitudes. Methodology:A modified Islamic and Indonesian version of the Revised Religious Fundamentalism Scale, the Right-Wing Authoritarianism Scale, and the Militia Scale were employed in an online survey.The survey gathered 308 responses and 85 of them completed. Results:Acehnese Muslims display a 69.3%, 54% and 58% attitude level of religious fundamentalism, right-wing authoritarianism, and militia sentiments respectively, displayingattitudes significantly higher than Toronto Muslims, Hindus, Jews, United States and Canadian Christians, and Ghanaian Christians and Muslims. Religious fundamentalist attitudes correlated 72% with right-wing authoritarian attitudes and 62%with militia sentiments. Right-wing authoritarianism correlated 61% with militia sentiments. Implications:The findings of this study are useful in understanding the interlocking social relationships of religious fundamentalism, right-wing authoritarianism, and militia sentiments. Specifically, these findings indicate the challenges the Indonesian government still face in empowering democracy and restoring the central government’s legitimacy in Aceh. Originality:This study adapts well-known scales into a unique Indonesian and Islamic context, providing a unique perspective in the discussion of religious fundamentalism, right-wing authoritarianism, and militia sentiments. It elucidates the unique personality of Acehnese youth, whom have been under studied. 1. Allen-Ebrahumian, B. (2017). Amid Rising Fundamentalism, Indonesia May Sentence Gay Men to 100 Lashes. Foreign Policy.https://foreignpolicy.com/2017/04/11/amid-rising-fundamentalism-indonesia-may-sentence-gay-men-to-100-lashes. Accessed 7 September 2018. 2. Altemeyer, B. (2006). The Authoritarians. Author. 6. Heufers, R. (2017). Indonesia’s Achilles’ Heel: Populist Authoritarianism. Strategic Review.https://worldview.stratfor.com/article/indonesias-achilles-heel-populist-authoritarianism. Accessed 7 September 2018. 10. Kirkpatrick, L. A., Hood, R. W., &Hartz, G. (1991). Fundamentalist religion conceptualized in terms of Rokeach’s theory of the open and closed mind: New perspectives on some old ideas. Research in the Social Scientific Study on Religion, 3, 157-179. 11. KPU. (2014). HasilPenghitunganPerolehanSuara Dari SetiapProvinsi Dan LuarNegeriDalamPemiluPresiden Dan WakilPresidenTahun 2014. Author.https://kpu.go.id/koleksigambar/PPWP_-_Nasional_Rekapitulasi_2014_-_New_-_Final_2014_07_22.pdf. Accessed 7 September 2018. 13. Rowatt, W. C. & Franklin, L. M. (2004). The International Journal for the Psychology of Religion, 14(2), 125–138. 15. Pearlman, J. (2014). Tsunami-ravaged Aceh in Indonesia now faces rising Islamic fundamentalism. The Telegraph.https://www.telegraph.co.uk/news/worldnews/asia/indonesia/11312688/Tsunami-ravaged-Aceh-in-Indonesia-now-faces-rising-Islamic-fundamentalism.html. Accessed 7 September 2018. 16. Sumaktoyo, N. (2018). Measuring religious intolerance across Indonesian provinces. New Mandala.http://www.newmandala.org/measuring-religious-intolerance-across-indonesian-provinces/. Accessed 7 September 2018.